I'm sure most of you have been keeping up with my series of posts about weathering powders and varnish and trying to seal them onto your models so they are usable for gaming. The more I get into this, the more I realize I know very little about the whole process and I'm only scratching the surface. As a way to finish off this whole thing before it gets completely out of control, I enlisted the help of misterjustin and convinced him to do a video for me showing me how he seals them in place when done. So what exactly have I learned through this whole thing? There are a number of things I've picked up by experimenting and all the comments others have left on the posts in this series. 1. Make sure everything else is dry. Powders come last for me. Make sure your paint is dry, any varnish and such is dry as well and you're not running the risk of any chemicals interacting. 2. There are lots of ways to apply powder to a model. 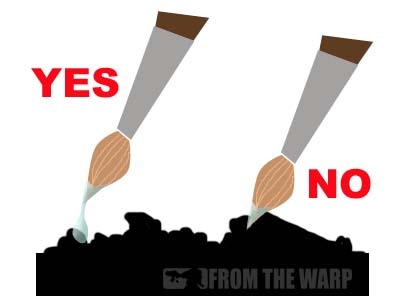 From sprinkling it on, to drybrushing it in place, dusting it on gently, mixing it with thinners, etc. It all depends on the look you want in the end. I am very light in my application. I tend to drybrush the powder in place and remove any excess. I like the "dusty" look I get from powders and use it for that more than I do other effects or texture. It's not wrong, just how I use them which is odd, because I am fairly heavy handed in all the other types of weathering I do. Go figure. 3. Varnish (of any kind) will have some effect on your powders in the end. You can minimize it by using good practices, experimenting beforehand and making sure you plan for the alterations in the end. When it comes to using alcohol, make you allow it to flow onto the surface of the model carefully. You don't want to disturb the powder by dabbing it in place and you don't want to use too much since it may move the powder around as well. This is my preferred method. While it may not permanently fix the powders to the model, it helps some and that's good enough for me. The trick is to not let the brush tip touch the model, but let the alcohol flow from the brush onto the model as the drop of alcohol itself touches the model surface. 4. Spray varnish is tricky and can be used at a distance if you're careful. The distance is the big thing. Like any other varnish, shake well, use in a ventilated area and there needs to be no wind for this to truly work. You want to be back far enough that you get only the lightest of dustings on your model. Anything closer and you'll destroy your powder effect. This takes lots of practice to perfect I suspect. Twenty miles might be an exaggeration, but you want to make sure you're back as far as possible. That's right, despite what I have learned and the frustration I have sometimes with them, I love the look I can get by using them. They are here to stay in my painting kit. They aren't everything, but they have their place. By using them in key spots when appropriate, carefully fixing them in placing with alcohol and watching how I handle my models, I should be able to come up with some great looking minis from here on out. But remember, it's all about the experimenting, once you get into weathering powders, there is so much you can do with them. It really is a matter of trying new things with them until you find what works for you and gets the results you like best on your own models. 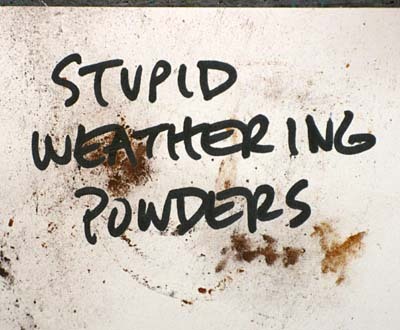 And a link to everything I've done about weathering powders to date. And last but not least, a special thanks to misterjustin for sharing his time. Thanks for this series, it has really helped me as I was curious about powders for some time. Your articles have convinced me that I am better served by continuing to use my wash and drybrush methods as I do not have the patience to do powders justice. Thanks again! The Pirate Viking: Don't let the work scare you away. It's like anything else, it takes some understanding and some experimentation until you get it right. I don't know of any other method that gets the same results... but like you've seen, it has it's pros and cons. 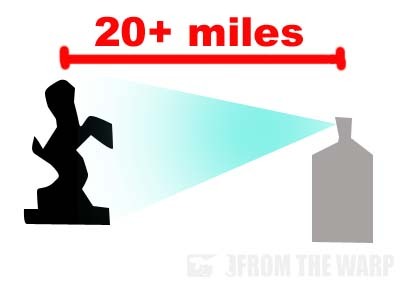 I think the 20+ miles image has got "meme" potential within the minis blogging community. Definitely made me chortle. "The trick is to not let the brush tip touch the model, but let the alcohol flow from the brush onto the model as the drop of alcohol itself touches the model surface." In the end it's all about effect. I keep 3 thinners and 2 fixers within reach of my pigments. Which I use, and how I apply it, depends on the project in question. When it comes to spray varnish - that's all about gaming models. I don't think I'd use this method for a display model. But if you're not going to be handling it then thinner alone might be enough to keep the pigment on the model. I've also subscribed to the comments on this one so I can keep up with any questions. misterjustin: can you list the thinners and fixers you use ? How about a guest article? I could do another guest article but it would need to focus on a specific question or two. The pigments topic is so broad I could easily spin a dozen articles and miss what you were looking for. As for the thinners and fixers - SURE! I still prefer alcohol for most of my work - as I prefer thinners and that's my favorite - but I'm also working with a chemist to produce an enamel fixer that doesn't take forever to dry. I've only recently started using weathering powders on miniatures, so I've sorta been learning as I go, as well. I've been using it both as a basing material (suspended in denatured alchohol) and as weathering for my Sisters of Battle (drybrushed). I was actually surprised by how much my matte sealer altered the appearance, so I'll have to try holding the can further back than normal and see what the overall change will be. However, in the end, they're gaming pieces, so I'll just have to deal with some minor discoloration for the sake of not having "cheetos-fingers" after every time I handle them! Jonathan: And that's the biggest thing... figuring out what works best for you and your own minis.